I did my biology diploma in biophysics, the title is: "Simulation von Large-Scale Motions bei der Substratbindung von Rubisco". It was part of a joint project of the Theoretical Biophysics Group and the Lehrstuhl für Biochemie der Pflanzen . 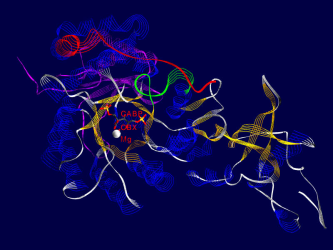 Ribulose-1,5-bisphosphate-Carboxylase/Oxygenase(Rubisco for short) is the most common protein in the biosphere of the earth. 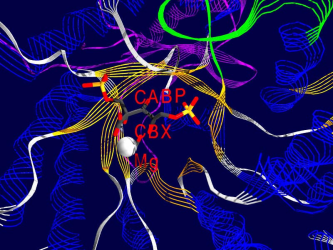 It´s purpose is to catalyze the addition of carbon dioxide on a small sugar-molecule (Ribulose-1,5-bisphosphate), the most important step in the dark- reaction of photosynthesis. My part of the work was the simulation and analysis of large conformational changes during the substrate-binding process with help of a newly developed GROMOS-based force-field (Schlitter et al. ), which can simulate solvent-effects without simulating the solvent itself (thus leading to a tenfold increase in computation-speed compared to simulations with an explicit waterbox). Here are some examples of what Rubisco looks like, together with some short interpretation of the structure and function of the molecule. All pictures are made from the 8RUB.PDB-structure from the Brookhaven Protein-Database (afaik this structure has been replaced by a better one recently), and have been rendered using SwissPDBViewer/DeepView and Povray , both programs based on WIN95 running on my P133, 24 MB back in 1999. This page was last modified on 13 April 2012, at 19:59.